The end of February has come and gone. Seems like it just came. I was so worried when I started my 2016 Temperature Afgan that I would never see the purple from my chart. The weather was quite warm for the time of year. But I have been very happy to see that I was able to use the purple. I added some fun sparkle yarn on the day of my birthday. After doing a little bit of calculation, I am worried that my blanket might be a bit small. So I have slowing added a few inches to each day's yarn. I use about 135 ish inches for each day. With the corner it is a bit tricky to count rows because those are short rows to create the myter corner. That's why I decided to just go with a certain amount of yarn for each day. Over all I am very happy with how it is turning out. Join my ravelry group to get started on your own. 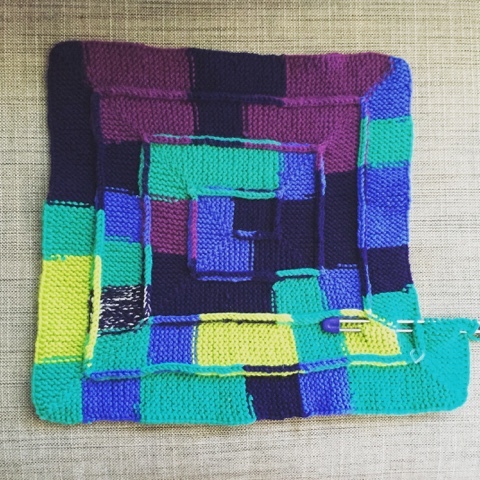 It is not to let to start and there are plenty of beautiful blankets to give you some inspiration.